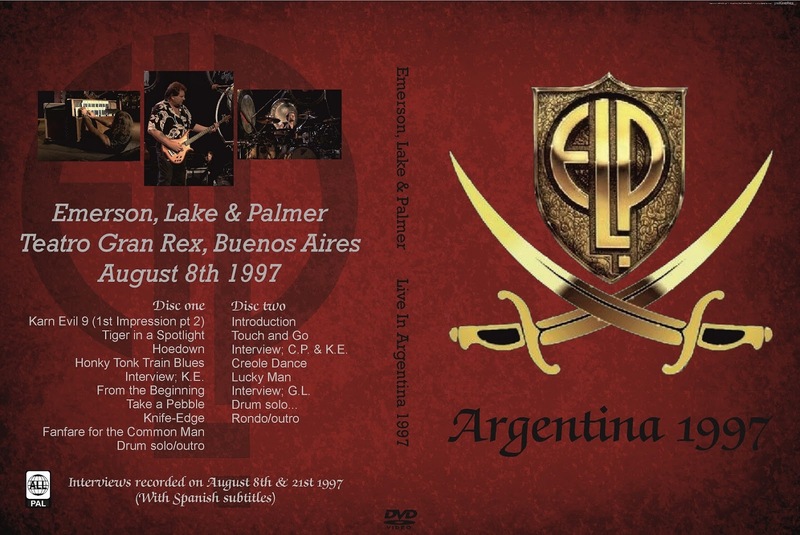 ELP played the Teatro Gran Rex, Buenos Aires on August 8th, 9th and 21st of August 1997. I'm confident the interviews on disc 2 are from August 21st, not so sure about the Keith Emerson interview on disc 1. In part, disc 2 consists of the tracks missing from the first programme, possibly due to camera problems (watch 'Lucky Man'). There appears to be a single disc version of this show/broadcast, with the interviews placed at the end and the tracks from disc 2 inserted into the correct running order. That DVDR is said to be from the 9th August but the material is from these same two broadcasts (and with an inferior bitrate). Anyway, this version has the crappiest artwork so I've done my own, in keeping with the style of the menus. If anyone is sure of the correct date, and that of the broadcasts, or if you're the guy who got on stage during 'Rondo', let us know. Note: BOTH the original DVDRs had corrupt .IFO files, which caused the picture and sound to freeze, replay the previous few seconds then continue onto the next freeze - which occurred every minute, on the minute. They were unwatchable, so out of necessity I learned to use VOB2MPG and Sony DVD Architect. It's my first attempt at DVD authoring and some things could have been done differently and better. I added chapter points and menus but retained the original audio and video bitrates so no extra recoding was involved.